Bioshock is more than just your average shooter because it throws a lot at you in terms of combat gameplay options. In addition to the standard selection of weapons that I have encountered in my two hours of play, a melee weapon, in this a case wrench, pistol, shotgun and machine gun, you are also equipped with plasmids. Plasmids are genetic enhancements that give the player special abilities like electrobolt and incinerate. All of these combat options are bound by a set of rules and it is essential for the player to learn these rules in order to complete the game. 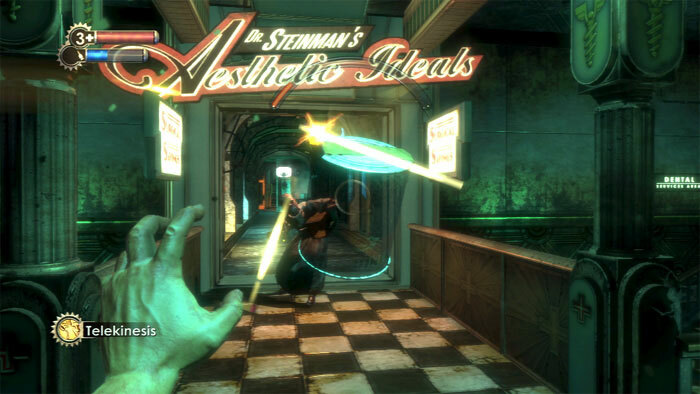 Bioshock does not layout all of the rules for the player to study at the start of the game instead understanding them is a process that takes place during gameplay. In the opening of the game, the ground rules are laid and explained outright to the player. The ground rules are the controls. Right trigger and bumper for firing and switching standard weapons and left trigger and bumper for plasmids. With the ground rules laid now it is time to learn the intricacies and options available to player. In some cases the game will provide hints. For instance in the opening level a hint pops up when you are using electrobolt encouraging you to shoot the water if enemies are submerged in it because water conducts electricity which kills the enemies quicker. It is easy to miss the quick hint, but even so, discovering this will almost always happen naturally during play, it is a leaky underwater city after all. 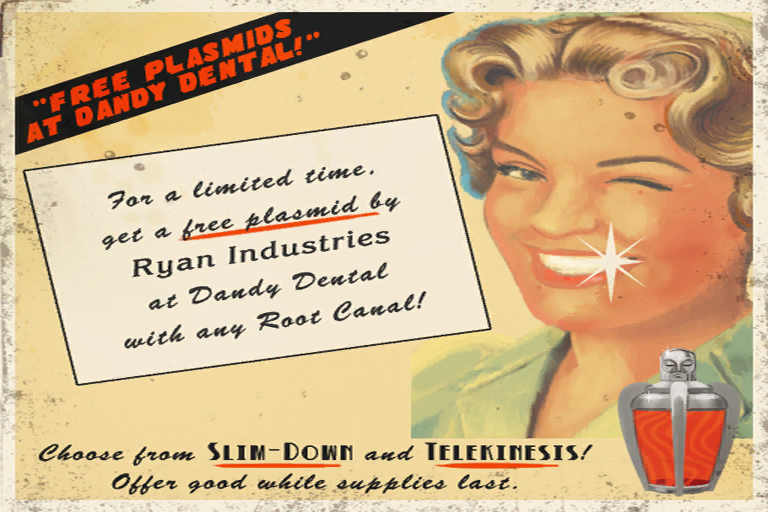 Bioshock also gives the player an opportunity to test plasmids and learn the parameters soon acquiring them. For instance, while in the Medical Pavilion you receive the telekinesis power up at Dandy Dentals. After continuing on to the surgery wing the first enemies you encounter are three slicers on a balcony about you. They start raining grenades down on your head which is the perfect opportunity to use the telekinesis power to catch them in mid air and shot them back at the enemy. Video games use this technique of giving the player a structured opportunity to test out powers and weapons while continuing the story. Each standard weapon has three ammunition types with varying effects. For instance killing the first big daddy to finish Medical Pavilion level is much easier if you equip electric buckshot for your shotgun. This rule is never explicitly stated but can be picked up through trial and error. What this all adds up to is that there are a myriad of combat rules that the player can learn to complete the game efficiently. The most interesting ones are not explicitly stated, but involve combining combat options in unique ways to make attacks more powerful. Ultimately these options increase the player’s level of uncertainty. This is important because it keeps the game interesting, by continuing to offer new experiences and not bogging the player down in repetitiveness.